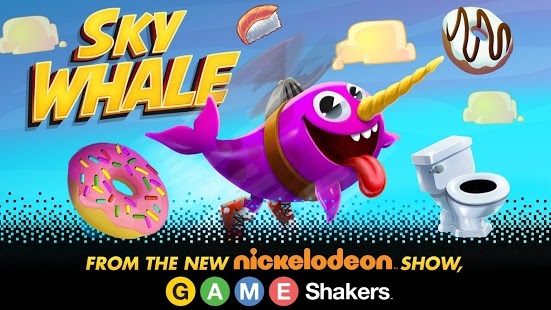 Sky Whale : Bounce through the sky collecting donuts to keep your narwhal up in the air! Use clouds and crazy objects to bounce higher and farther. Insane combos will take your narwhal into outer space. And scuba gear will send him on an underwater adventure. Earn coins to unlock awesome items, blasting your narwhal farther than he’s ever gone before! · Play the REAL game from Nickelodeon’s new show: GAME SHAKERS! · The more donuts you collect, the longer you bounce through the sky! · Insane item combos add boosts to your bounce like: DOUBLE MONEY MONKEY TOILET! · Pick up the special rainbow donut to trigger the ultimate SUGAR RUSH! · The more you unlock the farther you go! New AR feature just added for compatible devices.